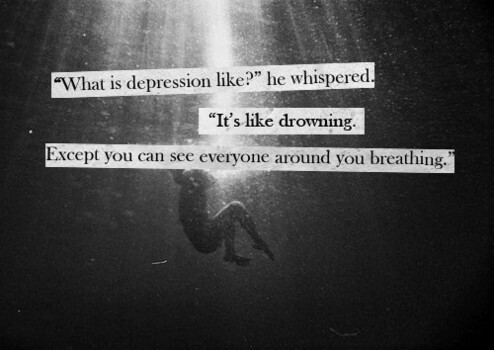 Almost all of us will, at some point in our lives, experience depression. The darkness within, the uncompromising bleakness and often unexplainable feelings of failure, hopelessness and emptiness. But how many of us admit it? How often do we bottle it all up, mentally reprimanding ourselves for being stupid, telling ourselves were being ungrateful, ridiculous, weak, self pitying..?? The list goes on. A list of self abusive words, taunts. A list of negatives which will only enforce the darkness and give the depressive part of our psyche even more to focus on and hold on to, giving it a firmer hold on our overall well-being. Its ironic the wording we use to try to snap out of it are often the very words forcing us deeper in and why? If a friend was feeling depressed, would you use those words of advice to them?? The answer is no, because quite frankly, they are wrong! We are not weak for feeling, we are not ungrateful or self pitying for occasionally getting snowed under by life’s less savoury moments! As long as we are trying, a long as we are fighting the internal battle we are not weak, we are strong! We are fighting day after day for something most people take for granted, going about our days when even the smallest task can feel like a struggle, every encounter with others feels like a trial, pretending everything is fine whilst secretly feeling so envious of their apparent ease at happiness. If only we opened up and talked…really talked! Most of us have had or regularly have depressive episodes, if we talked to each other more not only would it help to know you are not alone, often the most surprising people will admit to feeling the same, but also just letting it out, hearing it all said out-loud and discussed as a real problem as opposed to just going round and round the same stale old thoughts in your head, trying to convince yourself your not feeling it, can really help give you some perspective. Of course there are also other things we can do to help ourselves. Personally I have a list of things which help. Some are instantaneous little pick me ups like singing as loud as you can in the shower, surrounding yourself with your happiest, silliest friends and just allowing yourself to forget and laugh, putting on your favourite comedy series or film. I swear The Big Bang Theory, Cougar Town, Mike and Molly and celebrity juice are sanity savers for me! There are also more longer term activities we can partake in to improve mental well-being. Exercise for starters. Whether its a full on workout or just some yoga or a walk, the benefits are enormous. Not only does this increase happy hormones in the body, but it tires us out leaving less energy for agitation and aggression. We will often sleep better as mind and body are feeling satiated. Of course a good diet is also key here, junk food actually contributes to the release of hormones which will counterbalance the positives brought on by exercise and makes us feel lethargic and bloated. Another beneficial habit is meditation, learning to let go and just be at one with yourself. Learning to relax and allow the universe to just be, accepting you are a part of a great vastness and allowing yourself to be lost in this. Getting a break from the mental chatter for a while and again aiding in sleeping. Reading a good book is often beneficial. I find a good book helps put my life into perspective for a variety of reasons, depending on the book your reading. For instance reading a horror will not only distract you by taking you to a whole new place and adventure but also make you feel it could be worse…You are not in fact being stalked by the rabid dog Cujo or being chased by some sort of fog or mist which is turning people into zombies. Reading chick flicks can also be helpful as they are often emotional but your heroines always find happiness in the end, the autobiographies are great for really showing you how everyone suffers, again your not alone. Then there are the little things, things unique to you which bring hope in your downtimes, light in the darkness and a smile to the saddest days. For me these are things like, tarot cards, getting creative making something, whether cakes, woodwork, paintings…anything, keeping a journal making sure to note good and bad feelings as well as things your grateful for, things you wish for in the future and short term goals which will help gain those wishes. Lastly, charity. OK so I don’t mean you have to go to a third world country and build a well for thirsty children (although if that floats your boat…why not! ), what I mean is doing something for someone else. Being responsible for someone else’s smile is incredible rewarding and not only that but if you believe in karma… This could be something simple like calling or writing to your Mum, Aunt, Grandma, someone who you know will be thrilled just to hear from you, your words brighten their day. You may want to bake or make something for someone, offer to babysit to give someone a break, picking up some of the extra workload from a stressed colleague or even just smiling at strangers in the street. So to sum it all up… You are not alone, this isn’t a solo fight. Your friends and family are there to help as long as you are helping yourself and giving back as well as receiving! Keep your chin up and one day you will look back on this battle and realize you won, and you can win again if and when that dark old enemy shows its ugly face again. Zen Woman’s Cyber Trive Gathering…FREE video! Yin Yoga to feel AMAZING! Fitness, Health and… on My meeting with Taoism. Kirsty Jones Fitness… on My meeting with Taoism. The V-Pub on My meeting with Taoism. Celebrating, promoting, and encouraging the art of handlettering.